January in Toronto is not the nicest time of year, so when I was asked to help set up an expanding graduate laboratory at the Naval Postgraduate School (NPS) in Monterey, California I didn't take too long to think about it. Having been to NPS last year to help set up their first Quanser Unmanned Vehicle Systems (UVS) Lab, I knew that Monterey in January is a nice place to be. In a busy 3-day visit to the Naval Postgraduate School, Quanser's Cameron Fulford installed the latest version of QUARC control software, installed and demoed over 10 unique Quanser experiments, and trained the graduate students in the use of Quanser's Qball-X4 UAVs. In my last visit to NPS, I set up a UVS lab with one Qball-X4 Unmanned Aerial Vehicle (UAV) and some Qbot Unmanned Ground Vehicles (UGV), along with a handful of rotary experiments based on our ubiquitous Quanser SRV02 Rotary Base Unit. This year, NPS was expanding the UVS lab as well as the controls lab by adding 3 new Qballs, 3 SRV02 plants, 3 linear cart plants, and a large number of rotary and linear modules that allow experiments to be quickly swapped on the plants. As a result, NPS now has a world class graduate-level controls teaching lab, and students there have unparalleled access to hands-on experiments. In a short, 3-day visit I was able to upgrade their lab to QUARC 2.2, install and demo over 10 unique rotary and linear experimentsto faculty and students, as well as set up and train the graduate students in the use of our Qball-X4 UAVs, which they are using for a variety of multi-vehicle, autonomous control research applications. 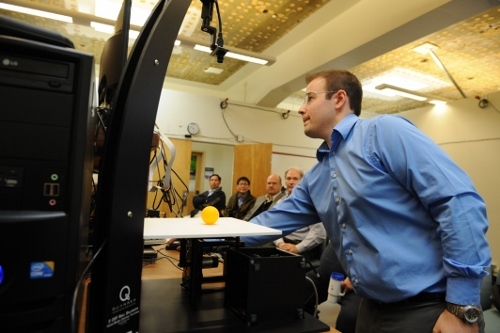 By the end of the third day, the graduate students were taking turns flying the Qballs using joysticks, but they hope to soon have them flying by themselves! I'm looking forward to the results of their multi-vehicle research using our Qball UAVs and the next chance I get to visit Monterey.